The IEC released its 2018 Environmental Scorecard and Representative Brian Stewart (R-Freeport) has been honored for his perfect voting record. Representative Brian Stewart demonstrated a commitment to environmental issues in Springfield this session, said IEC Executive Director Jen Walling. It is an honor to support common sense legislation that is good for our environment, said Rep. Stewart. I am especially honored to see the passage of the Industrial Hemp Act, which was the mission of former Illinois State Representative Ron Lawfer. Representative Brian Stewart voted 100% of the time with the environmental community on nine pieces of key legislation, added Walling. The IEC is honored by Representative Stewarts dedication to Illinois environment and we look forward to working together in the future. The Illinois Environmental Council (IEC) is a non-partisan 43 year-old organization that promotes sound environmental laws and policies, provides a forum for environmentalists and facilitates a statewide activist network. IEC performs legislative advocacy and serves as the environmental communitys eyes, ears and voice in Springfield. 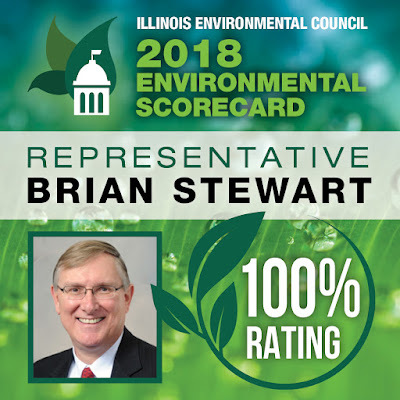 More information on the 2018 Environmental Scorecard can be found at ilenviro.org.